Plug & Mix adds 5 new plug-ins to the VIP Bundle. The Plug & Mix "V.I.P. Bundle" (that now includes ALL 50 VIP series plug-ins) is a comprehensive toolset, a perfect swiss army knife collection of plug-ins from EQs, Compressors, Amp Sims, to Reverbs, Delays, Bit Crushers and many more. They’ve got them all. P&M plug-ins are a serious option for high profile engineers and project studio producers that need inspiring effects that sound great, and are easy to use. 50 High Quality Audio Plug-ins. In today’s Music Production fast pace is key for professional studios to be competitive. Plug & Mix offers a very complete set of tools that enables one to work quickly while providing a professional sounding result. That is also why they have found their place in Educational facilities, letting students train on "easy to use audio tools". At Plug & Mix, it's easy. They let their clients OWN the product they paid for and they get lifetime upgrades for FREE, always! Those users who bought the initial offering of 20 plug-ins years ago, now have an additional 30 plug-ins in their bundles, which obviously makes them very happy. 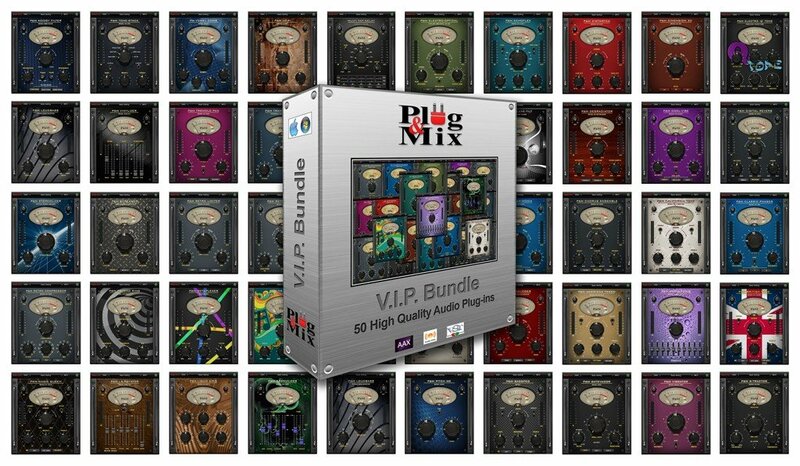 The Plug & Mix VIP Bundle and individual plug-ins are distributed by Plugivery and are available from all reputable Pro Audio resellers. Single Plug-Ins Promo Price: USD $9.99 (MSRP $49). In today's market, music production is constantly evolving. Producers and artists alike need professional sounding plug-ins that are simple and easy-to-use. All too often, precious studio time is wasted, struggling with audio plug-ins that are unnecessarily complicated to install and operate. Plug-ins need to inspire creativity, not restrict it! In response to users demand for high quality and efficiency, P&M has developed a series of plug-ins that will change the way you think about plug-ins. We at P&M have partnered with leading plug-in designers from around the world to bring you the V.I.P. plug-in series.